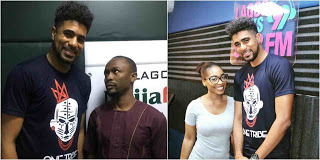 Thin Tall Tony, who was evicted from big brother naija house on Sunday, has kicked off a media tour shortly after he arrived Nigeria. The multi-talented housemate and father of two, was pictured with OAP/Actor, Ushbebe at Naija FM, was also spotted at BeatFM today. denied his family, showed he's talented while on the show.